Community education - how measurable is it? We spent a quiet couple of months in the Callan and Freshford community gardens during the summer months with the long, lazy days ensuring we all managed to spend some down time. Now the children are back in school we’re firmly back in action in the gardens and have some exciting plans ahead. Having announced at the end of the 2013 Savour Kilkenny Food Festival that they never wanted to make, preserve and sell home-grown produce ever again, like the memories of childbirth, Callan gardeners seem to have forgotten all the painful bits and have not only announced they want to give Savour another go, they’ve invited the new Freshford gardeners over to the kitchen to help them make this year’s batch of preserves and get involved with the selling of them. I’ve mentioned before how unique community gardens are with no two alike and the gardens in these two rural Kilkenny villages are no exception. Callan garden began in 2010 with the local men’s group working hard to create an area where people could grow their own in a small patch of land at the back of Droichead Family Resource centre. Since then raised beds were installed along with a polytunnel and various groups have taken on small bits of land to learn how to grow their own food. 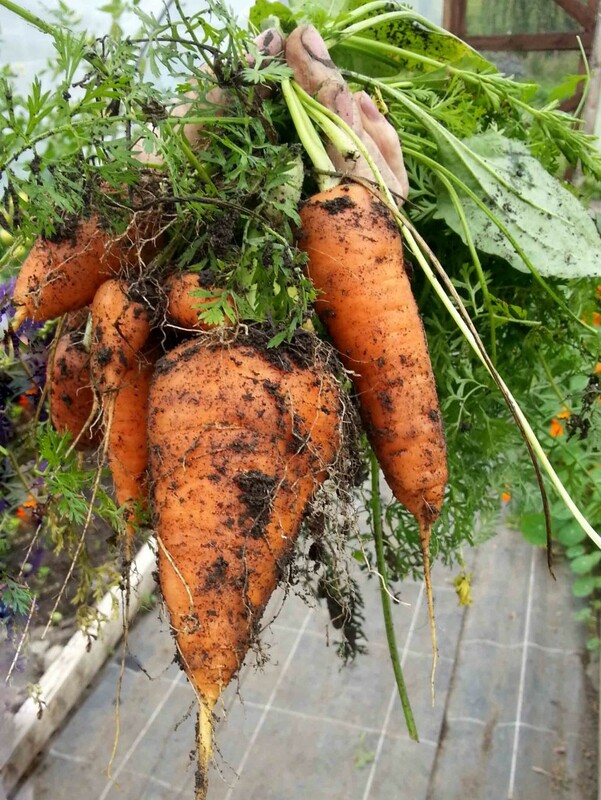 I’ve been working with a mixed group of older gardeners here as part of the Kilkenny Leader Partnership Community Garden initiative since October 2012 and some of you may remember the excitement last year of bringing our first product literally to market alongside Goresbridge gardeners. During the spring of this year I began work at the Freshford garden and we started with a blank canvas. 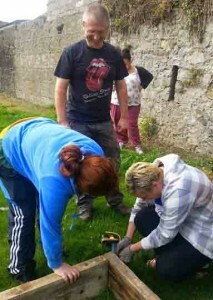 That didn’t faze me at all at the beginning as I’ve helped other groups turn lawns into productive community gardens. What has proved different here however, has been the lack of material funding. 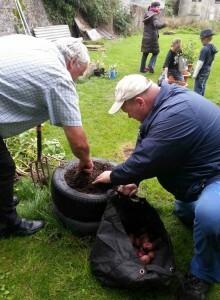 Up to a dozen younger men and women involved in the garden are participating in Fetac Back to Work schemes in Freshford, a rural village that has one of the highest rates of unemployment in the county. The group are developing the community garden as part of their work experience modules, behind the FAS supported centre which is located opposite the village green. Where Callan has everything from beds to polytunnel, tools, equipment, water and seeds, Freshford garden has struggled from the beginning. It’s very difficult to build a garden with no funds, direct access or running water, and when you can’t buy any equipment to support its growth, it’s hard to motivate people. What the garden lacks in cash however, it gains in commitment from a small core group of people. They can see the potential benefits to the community of creating a vegetable garden at the Centre, as well as to the lives of the people who are working in it. Lack of cash encourages inventiveness so reusing and recycling have become very much the norm, even down to making tools out of plastic bottles and using wheely bins instead of wheelbarrows. 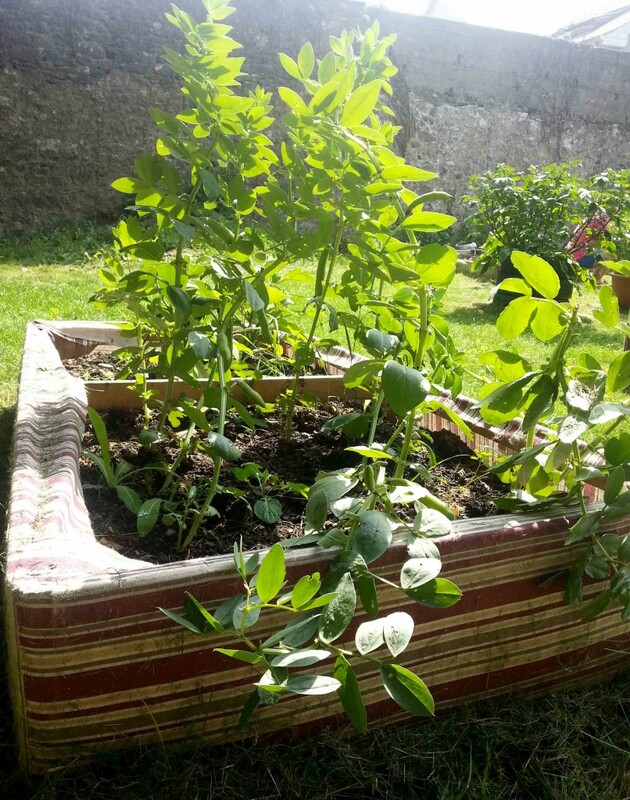 The advantage of one tutor working with several groups in the Kilkenny Food Initiative is the connection that can give. 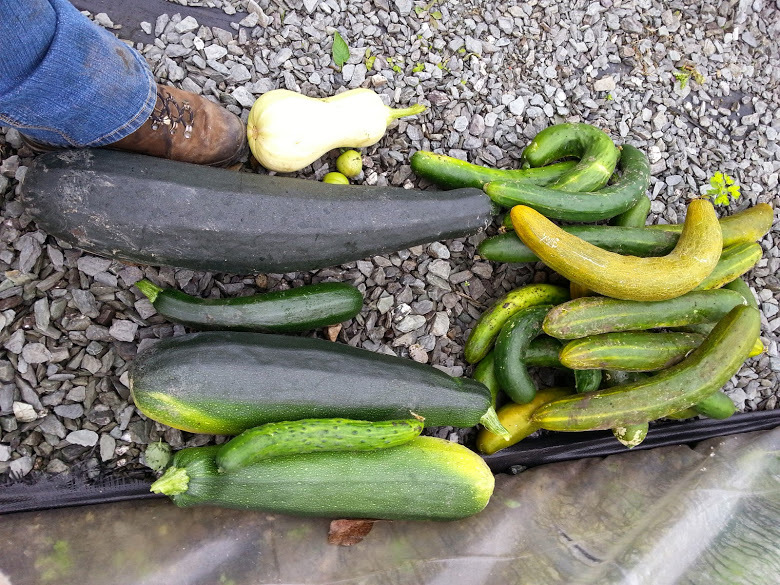 In this case, Callan have heard the plight of the Freshford group and although they can’t offer tools, they do have an abundance of veg growing in their garden. Without prompting they offered to share their knowledge with the younger group and show them how to preserve and sell it. The significance of this small gesture cannot be underestimated. If there was one lesson I can pluck out of the experience of growing, preserving and selling our produce at Savour Kilkenny food market last year, it’s how it gave everyone a lesson in resilience and sustainability. 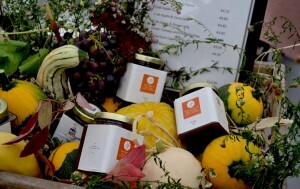 Although we didn’t make a huge profit, or sell all of the preserves we made, we learnt a lot of valuable lessons. The kind that you only really gain when you’ve experienced something for yourself. Enough money was made by the sale of the produce to give the gardening kitty a big boost at the beginning of this year. Thanks to the proceeds of the autumn sales, Callan and Goresbridge were able to buy seeds, compost and general gardening bits and bobs without having to hold out their hands and ask for donations. Instead of wondering where the funds would be coming from, the groups were not only able to buy tools and equipment from the money they raised themselves, they were able to contribute to the coffers at the hard pressed centres that house them. The project gave the gardens some independence which allowed them the opportunity for growth. For the gardeners involved that was a significant turnaround. The men and women involved in last year’s food project also found that homemade pickles and preserves, once wrapped up and prettified, made wonderful gifts for friends and neighbours, something the Freshford group may be interested in learning more about as Christmas draws closer. As a result of rural unemployment, motivation, general health and happiness as well as the overall mental health needs of people living in small communities, have suffered greatly. Far from the powers that be addressing these issues, agencies who are trying their best to help are now seeing their funding opportunities slashed. In an economy that’s so caught up with facts, figures and live register numbers, its the ‘softer’ skills we learn in life that can make the difference to our quality of life. These skills can be difficult to quantify and aren’t necessarily measurable on a spreadsheet. Community education offers opportunities for adults to learn simple life skills that have been forgotten and allows us all to reach out to one another and connect. Whether we are learning basic life skills such as how to grow food, weave, cook, bake and sew, relaxing with Tai Chi or art, or upskilling with bookkeeping, computer courses or office skills, we are offering opportunities to get people together, socialise, laugh, relax and make new connections. 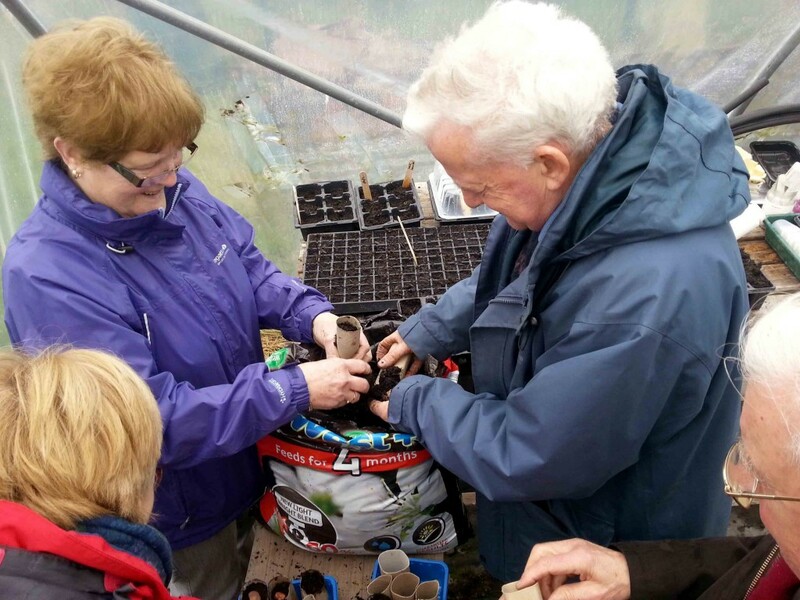 With the lack of money perhaps it’s these small acts of kindness such as that shown by the Callan gardeners, where we reach out to one another, share knowledge, skills and experience, engage and communicate, that’s helping communities to survive and giving them hope that they’ll grow once more. My experience of working and living in rural communities is that we’re still a long way from seeing the return to boom time figures that are jovially being reported on all the national news channels. Low cost community education is helping to see many through.